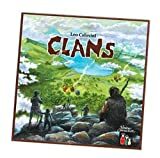 The game is set in late prehistory, a time of transition - when our distant ancestors, who had struggled and barely survived for ages in very small nomadic groups, began to feel that their lives would be more secure and less arduous if they formed larger groups. This led to the formation of the first villages. A board showing a vast area divided into 60 territories of 4 different types. 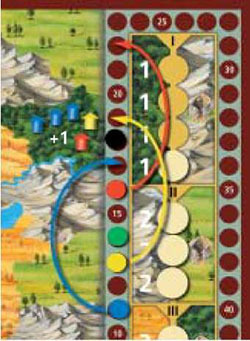 These are grouped into 12 regions, each containing 5 territories; these 12 regions, bordered by rivers, the shores of lakes, and the edge of the board, are used only in the preparation phase of the game. The 60 territories are of 4 types: forests (dark green), mountains (light gray), steppes (tan) and grasslands (light green). Also on the board, but separated from the playing area, are a chart of the five epochs of play and a scoring track of 60 spaces. Distribute the 60 huts on the board, one per territory, as follows: form 12 groups of 5 huts (each hut a different color), place each of these groups in one of the regions; then place the 5 huts randomly, 1 each in the 5 territories of that region. This procedure ensures an adequate dispersion of the five colors throughout the board. Shuffle the 5 colored clan cards and deal one face down to each player. Don't let other players see what color you received. Return the unused card (or cards, if fewer than 4 are playing), face down to the box. Place the 12 village chips face up on the spaces of the epoch chart. Place the 5 small scoring discs behind the starting line of the scoring track. There are always 5 clans in play (regardless of the number of players), each clan identified by a color: red, blue, green, yellow, and black. Each player tries to score points for his secret clan, while keeping his color secret from his opponents. Choose a starting player by lot. That player starts and then play continues in clockwise order. There is only one kind of move in this game: the player, whose turn it is, moves all the huts from a territory of his choice to a neighboring territory, provided neither territory is empty. In this manner some territories become vacant while villages are formed in others. There is an important restriction: a player cannot move huts from a territory that already contains 7 or more huts. A player may move huts to such a territory. 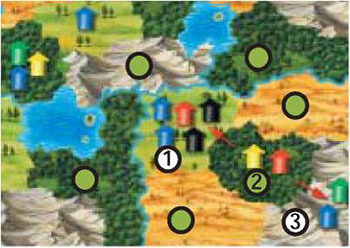 In the rare case of two neighboring territories containing 7 or more huts each, a player may move the smaller group to the larger one. 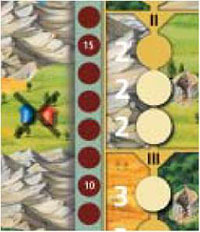 If both territories contain the same number of huts, the player may choose which group to move. 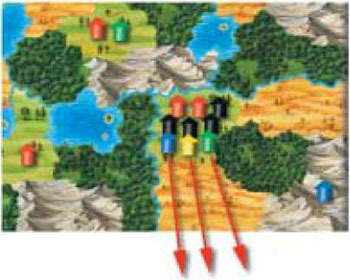 In this area, a player can move the group 1 huts to only two possible territories, as the other neighboring territories are empty. A player may not move the group 2 huts as they number 7 and cannot be moved. Note: Two territories separated by a river are adjacent; two territories separated by a lake are not adjacent. When a player moves huts such that a territory with huts (or a single hut) is completely surrounded by empty territories or the edge of the board, a village is founded in that territory. When a village is founded, the player who made the move takes the next village chip from the epoch chart (the chips are first taken from the first epoch, and then the second, and so on) and places it before him on the table (at the end of the game he will score one point per chip). The player then calculates the value of the village and the scoring discs are moved accordingly on the scoring track. The huts in area 1 become a founded village when the huts in area 2 are moved, either to area 1 or to area 3. The huts in area 2 may not be moved to area , as that territory is empty. 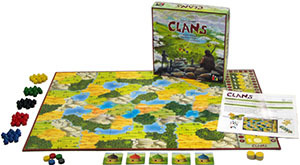 The different clans (represented by the different colored huts) generally get along peacefully. However, when all five colors are present when a village is founded, there is strife. In this case, when the village is founded (but not before), all single huts of a color are eliminated. 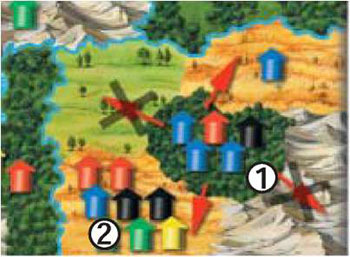 Example: in a Just founded village there are 9 huts: 4 black, 2 red, 1 green, 1 yellow and 1 blue. Since all 5 colors are present, the single green, yellow, and blue huts are eliminated and removed from the board. The size of the founded village is also reduced to 6. The game is played over 5 epochs. In each of the first four epochs, one type of territory is particularly favorable for the formation of villages while another type is extremely unfavorable, so that any village completed there in that epoch is inevitably doomed. On the epoch chart, the left side indicates the favorable type of territory, the right side the unfavorable one. In the 5th epoch every kind of territory is favorable. When a village is founded in a favorable territory, the clans involved score bonus points for the village. 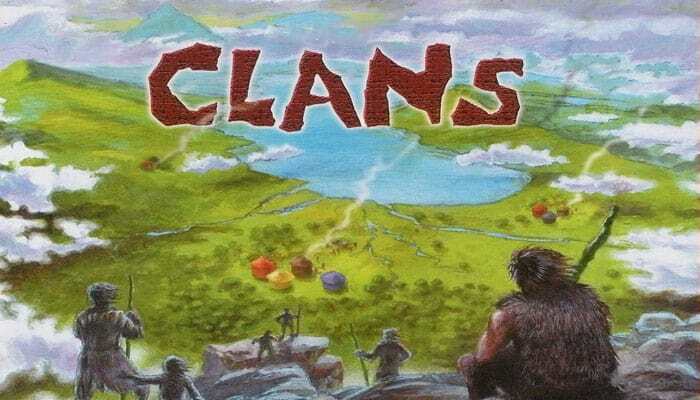 When a village is founded in an unfavorable territory, it is destroyed and the clans involved score no points! The number of villages founded in each epoch corresponds to the number of village chips in that epoch (4 in the 1st epoch, 3 in the 2nd and so on). An epoch comes to an end when all of its village chips have been taken. Then, the next epoch begins. When player makes a move that causes 2 or more villages to be found- ed at once, that player decides the order that the villages were founded in. This can be particularly important when the founding cross epoch boundaries. Also, if a player founds the 12th and last village and more in the same move, he decides which is the 12th village (and it scores with the 5 point bonus). Any other villages founded with the 12th village do not score. The village is founded in the kind of territory that is neither favor- able nor unfavorable: in this case the basic value of the village is the total value. The village is founded in the favorable kind of territory for that epoch (left side on the reference table): in this case, the value of the village is increased by the value of the bonus in that epoch (shown on the epoch chart), which increases from epoch to epoch. The village is founded in the unfavorable kind of territory for that epoch (right side on the reference table): in this case the village is doomed, its value decreases to zero and all its huts are removed from the board. In the 3rd epoch, the steppe is the favored type of territory. Therefore, the clans involved earn 3 bonus points. In the 2nd epoch, the grassland is the unfavored type of territory. The village's value is 0! After calculating the value of the village, all the scoring discs of the colors present in that village are moved forward on the scoring track by the value of the village, regardless of the number of huts of the color. That is, having more huts in a village, does not give an advantage. There are 5 huts in village 1: 3 blue, 1 yellow, and 1 red. It is founded in the 1st epoch in the forest: the favored type of territory. Thus, the village is worth 6 points: 5 for the huts and 1 bonus point. The blue, red, and yellow scoring discs are moved 6 spaces on the scoring track. The game ends immediately after the 12th village is founded and scored. 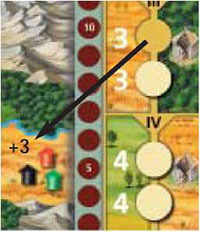 This last village always scores the 5 bonus points, no matter the territory in which it is founded. It can also happen that no more moves are possible before the 12th village is founded. In this case, the game ends immediately without scoring more villages. At this point, all the players reveal their secret colors, turning their clan cards face up. Remove the colored scoring discs from the board that are not in play. The players move their scoring discs forward on the scoring track to score the village chips they collected for founding villages (1 point per chip).